The rule for buying any books in England was as follows: not available for Kindle and/or some specific or unique tie. I think I did pretty well bringing back only 4* (one on the way from Amazon because I was still regretting not buying it at Stonehenge despite the font). 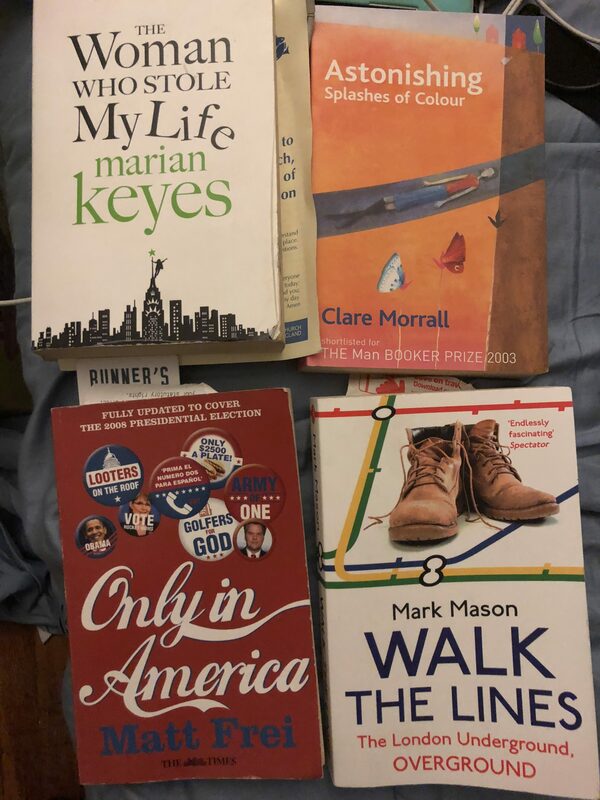 The top two were charity shop purchases in Stratford-upon-Avon: love Marian Keyes and she’s not easy to find here, and Liz thrust the second at me as it was set partially on a bus we’d taken. The bottom two were London finds. Only in America is the BBC Correspondent on life in America in the early 2000s, which I found at the South Bank book stalls. 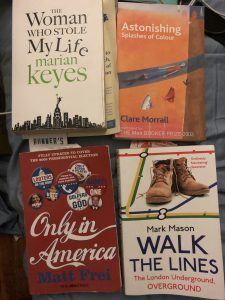 I found Mark Mason’s Walk the Lines: The London Underground, Overground while waiting for my train at London Euston to meet Liz. After finding WiFi to ascertain it wasn’t available for the Kindle and was well priced, I bought it. What caught my attention? Walking. Of course. Fittingly, it’s the 80th book I finished in 2018 and I often lament that reading is a casualty of my love of walking. If I took the train more, I’d definitely read more. I loved this book from its premise but rather than reading it on the train to & from Birmingham, I was staring out the window at the sheep. Yes, sheep. I got the bulk of it read on my flight home last weekend but didn’t want to carry it in my purse, so it took me until Sunday at the beach to finish it. Had Friday turned into beach weather it would have happened then. Although it felt like I walked all over London, I didn’t hit even a fraction of his 269 Tube stations. As I read about places I was/had been, especially Pimlico early in his walk, I loved those moments of I know that place! That happens often for me in New York, but I think London is the first place it happened for me because of all the walking. I only took the Tube six times in London: to and from Heathrow, to Kings Cross (to do Platform 9 3/4 on the way to Euston), from Marylebone to hotel to drop off my bag and make a mad dash to St. Paul’s for sunset, to the hotel after a late-ish dinner/long day in South Kensington after Stonehenge and home from dinner on the South Bank in the rain. Taking the Tube would have been more time efficient (especially when going from South Bank Festival to the British Museum and/or Buckingham to Kensington Palace) but I really think walking nearly everywhere helped me better get the lay of London and incorporate sightseeing with “commuting”. I did some of this in Amsterdam too, although the weather wasn’t anywhere near as conducive to it. The days I was fully in the city I averaged about 12 miles. Even the ones with transit were in the 8-10 mile range with the exception of Stonehenge which was full day driving. London is just perfect for a wander or focused walk. What helps is that the stations are so close together – it often didn’t pay to spend ~$3 to get between places A and B when it was just as easy or easier to walk. In doing so I managed to see things I wouldn’t have otherwise including: the book shops on Charing Cross Road, the theaters of Drury Lane, the Cleopatra’s Needle along the Thames, Churchill War Rooms and Downing Street and more. None of those were on my itinerary, but I was so pleased to stumble on them. While most of my walks were in daylight because I was otherwise too tired, the dusk walk from St. Paul’s back to my Tower Hill hotel was great in seeing how the city switched off. Would I recommend my walk sightseeing of London to another visitor? It depends. There’s a lot of “lost” time so if you only have a short time, I might say hop the Tube. But if it’s someone like me who enjoys the journey and the unexpected finds along the way? Absolutely. I’d love to do a walk like Mason’s in New York, although I can’t imagine it would be anywhere near as feasible, especially in the boroughs. Manhattan though might be a bucket list when/if I ever finish the bridges. the “government buildings” on the south side of Vauxhall Bridge. I had a feeling when I ran that way on Tuesday that it was either MI6 or some other not so secret entity based on the number of armed men and CCTV. Haven’t seen much James Bond, but I do read Daniel Silva and Gabriel Allon frequents Vauxhall. “one almighty temple to Travel known as VIctoria” yep. Aside from my last day when I got super turned around near Borough Market, the only time I came even close to that was walking back to the hotel from the V&A via Harrods. All the roads seemed to go kablooey around Victoria, which is a behemoth. I loved his walk down Piccadilly from Green Park toward Hyde Park Corner and beyond. This was my first real exploration of London on Sunday morning (more, TK, when I post the London Palaces writeup) when I walked from Horseguards to Kensington Palace along Piccadilly because I wanted to find the Hard Rock Cafe. I don’t eat or shop there, but this tradition with a friend goes back to when we lived in Osaka and would use it for American food. Also, I started “collecting” Hard Rocks as a kid after my first in Toronto in 1993, and sometimes you have to. Besides, why not take the longer and more scenic route between two places when possible. You see so much. I saw the Ritz, which he mentioned but did not know about Burlington’s prohibition against whistling. It was also fascinating to learn why the line went so far south of Harrod’s — plague pits! Part of what made this book even more interesting is the people he interviewed: the city planner, the voice of Mind the Gap on the Piccadilly line. It added so much more to an already interesting book. “The tourists at Tower Hill stand on the same ground where huge crowds used to gather for executions…” creepy! OK, maybe I’m glad I didn’t read this part as I stood there. The Waterloo and City Line was super confusing. How is that even a line? That said, I was glad to have it when I needed to get home from Waterloo in the rain. Although the connection from Bank to Monument is long, it was great to do it below ground so as not to get more wet. I loved his idea of a personal Tube line for the places and moments that are significant. For me in NY, it’s the Upper East Side and on a running note, Central Park. Part of what I loved the most about London – especially in The City where this description is from – is the layers upon layers of history. Discoveries like The Great Conduit when building One Poultry, and items extant from before The Great Fire are all over and it’s really only possible to find them when wandering. Or even walking with purpose like Mason did. One of the places on my ginormous google map that I didn’t get to was Olympic Park – it was just too far out. While I rarely watch the Olympics, I love visiting their “remains”. Mason’s walk was in the lead up to the Olympics where many sights were still being constructed and I enjoyed how he imagined their use. I did visit a couple spots where Olympic events took place, including Greenwich and part of the route of the marathon, which made me think of Becky Wade’s book as she was there for the games. Loved his realization that the issue with the view from Tower 42 and Barnet church was that it was still man’s eye view. I never thought of maps that way and while I’m not a maps person, I liked how he used them throughout. Not just the literal journey planning, but to explain the city. To truly know the lines. The book? It’s traveling again now, back to Liz who mentioned she had it on her wishlist. A lovely review and I really like that you got to have “I’ve been there” moments while reading it. I used to walk around when living in London and it helped make a sense of the city that I still retain today and is very useful. Can’t wait to read this myself!